Router Workshop: Cutting A Dado On An Angle! Cutting A Dado On An Angle! 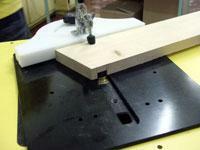 When we made the Shop Step Stool as seen on Series 5 DVD we used a Mitre Gauge with a straight bit to cut the dados. This enabled us to cut each one exactly the same at the correct angle. Check out this tip to see how. Use 1" thick stock that will fit into the slot of the mitre gauge and cut your desired angle on the end of the block with a mitre saw. This will be your set up block. 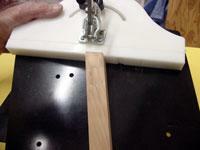 Loosen the mitre head knob on the mitre gauge and place the 1" block into the slot. 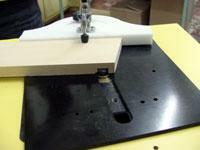 Slide the set up block tight against the mitre head and adjust the angle to match. Tighten the mitre head knob. Chuck up a 3/4" straight bit in your router. 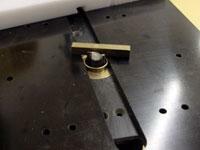 Lock a 1" brass guide into the base plate and place the mitre plate over the guide. 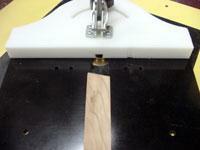 Use a brass measuring bar to set the depth of cut to 3/8". 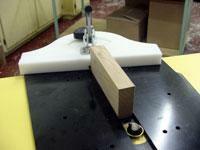 Mark the location of the dado cuts on your stock, line up with the bit and lock the stock into place and cut. If you find there is tear out we suggest you cut your stock a little wider than required and trim to size after the dado is cut. In the case of our stool we needed an angle dado on both ends. In order to do this you will need to use the set up block again (the opposite direction) and reset the angle for the other side. Use the pencil marks on your stock as before, lock in place and cut.